Rogers Architects & Planners works with clients to translate their requirements and ideas into a cost effective, pleasing reality. We tailor our designs to suit your site and individual needs while responding to your brief in an effective and innovative manner. We specialize in new homes, extensions and unit / apartment developments from Metropolitan Melbourne, to the Mornington Peninsula, to country areas. Our service does not stop at the design process – it includes the engagement of building and other consultants to ensure the translation of the design into a practical and pleasing built form. Being involved in over 4000 projects, we have many years experience dealing with councils and authorities and can guide you through the various approval services required to bring your project to reality. 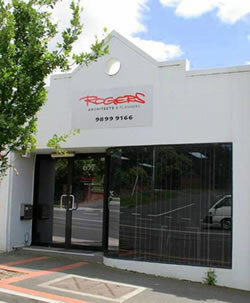 Rob Rogers set up his own architectural practice in 1983, based in the eastern suburbs and providing architectural design and drafting services in residential, commercial and industrial architectural design. In 2000 Rob became a corporate member of the Planning Institute of Australia, adding town planning to the services provided. The company moved to its present offices in Mont Albert in 2004 and Rob works with a small but dedicated team to service clients from Metropolitan Melbourne and surrounding suburbs, to the Mornington Peninsula, to country areas and further afield interstate. Rob Rogers qualified with a Diploma of Architecture from RMIT and a Bachelor of Architecture from Melbourne University in 1972, after which he undertook 2 years post graduate study for a Bachelor of Building. Rob worked for a number of years with the Commonwealth Government on projects including Tullamarine Airport, Government Offices and Defence Base Facilities around Australia. Rob ran his own design and drafting company mainly involved with housing developments and later working as a partner in a larger firm designing a number of TAFE colleges, office buildings and ski-field developments. Rob left the partnership to set up a sole practice, specialising in planning and designing multi-unit residential developments and project home design, as well as continuing to provide residential design services for new homes and renovations. Rob employs a small dedicated team of architects, draftsmen and 3D architectural visualization specialists that work together to realise your projects full potential. Rogers Architects provides architectural and drafting services on either a percentage or a time rate fee basis, tailored to the client’s requirements. There is an intial no obligation meeting which allows the client to outline the expectations for their project, and enables us to formulate a realistic initial design and budget. Once fees are agreed, they are payable as stage payments as each stage of the work is completed. Rogers Architects, with their background and experience in construction, are able to develop realistic budgets and construction time frames to assist with the management and completion of your project. To arrange a no-obligation consultation to discuss your project, call us on 03 9899 9166.